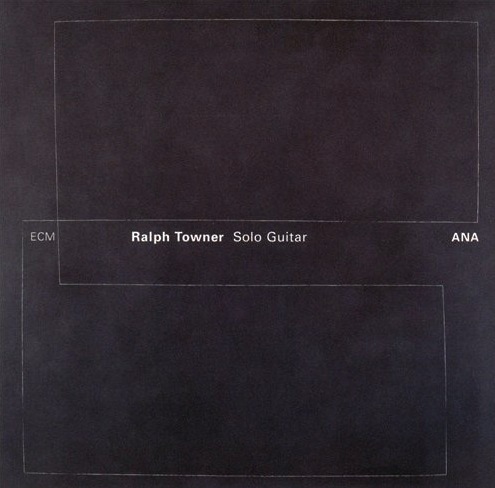 The release of ANA marked the return of Ralph Towner the solo artist. Following the 17-year gap since his Solo Concert, the Washington-born guitarist/pianist/composer had certainly left behind some immense shoes to fill on that earlier masterpiece. Yet once the strains of “The Reluctant Bride” ladle their waters over our ears, we know that comparison is a dirty word. The depth of nocturnal energy bespeaks an artist of even deeper resolve, one who approaches his guitar pluralistically. The tenderness therein introduces us to a colorful mosaic of programming. Lobbing bright yellows over muted blues in “Tale of Saverio,” Towner looks skyward while never forgetting the earth that bore him. As in the music of Dino Saluzzi, we sense children and laughter mixed into a nostalgic cocktail. He then looks beyond the palette into the ethereal schemes of “Joyful Departure,” in which his field of dreams requires not building but a gaze that transcends life and fantasy put together. To this he adds hues “Green And Golden,” casting moods like chaff into the wind. Shades of Marc Johnson’s “Samurai Hee-Haw” haunt the ground line of “I Knew It Was You,” a reflective piece that presages the album’s most painterly strokes in “Les Douzilles” and contrasts the buzzing preparations of “Veldt” in an enchanting way. Towner ends with Seven Pieces for Twelve Strings. Like the album as a whole, it is a set of vignettes you want to linger before, to take in and appreciate. Between distant shimmers and proximate footsteps, he stretches a chain of thoughtful pauses unleashed by bursts of narrative activity. On the whole a contemplative album that resonates with insight, ANA shows Towner at his most flexible, not so much plucking as bending the strings to the will of an unmistakable lyrical drive, and all with a comfort natural enough to sing without ever needing to part its lips.